It slows or stops the growth of cancer cells in the body. Treatment is usually together with other chemotherapy drugs (such as cytarabine), and its administration depends on the type of tumor and the degree of response. 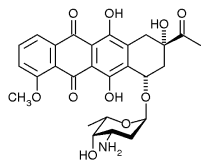 In addition to its major use in treating AML, daunorubicin is also used to treat neuroblastoma. Daunorubicin has been used with other chemotherapy agents to treat the blastic phase of chronic myelogenous leukemia. On binding to DNA, daunomycin intercalates, with its duanosamine residue directed toward the minor groove. It has the highest preference for two adjacent G/C base pairs flanked on the 5' side by an A/T base pair. Daunomycin effectively binds to every 3 base pairs and induces an local unwinding angle of 11o, but negligible distortion of helical conformation. From Townsend Letter for Doctors and Patients, 5/1/04 by Ralph Moss, W.